I’m getting a lot of questions about my choices for choosing IIN over any other health and nutrition coaching programs so I figured I’d give some insights on my choices. So to give you a little background history we’ve gotta go back a decade. My first career out of school was a hairstylist and an educator for haircare brands like Rusk, Goldwell, and Kerastase. That was a 10 year career for me that started because of my strong passion for helping people find their personal style. This interest in hair all started in high school when I met my hairstylist and long time friend Dara Ung. She gave me my first “expensive” haircut and I remember walking out of her salon feeling as if I owned the world. I connected so much of my self confidence and self expression with how I felt and I knew how important this was for others to feel the same. In high school, I used to color friend’s hair in my mom’s kitchen and shortly after high school I decided that helping others feel beautiful through their self expression in their hair was my calling. 10 years into my career as a stylist I felt like I had done all I wanted to accomplish and the opportunity to take a Director role at the start up VSCO came along. After months of thinking about the opportunity I jumped and decided to challenge myself with something new to learn and grow. After 5 years at VSCO and getting laid off it was time for something new. When I started my fitness journey I was amazed at what having the right mindset to pursue your goals and dreams were. I think I speak for a lot of us when I say that the two hardest things in adult life to get a balanced control on are finances and fitness. If you’re one of those who’s got the formulation to all this then maybe we can talk, but for me the two largest challenges in my adult life have always been finance and fitness. Both take a lot of discipline and dedication and a lot of energy. Sometimes adding another “thing” on top of all the other “things” in our busy adult life is a challenge in itself. And if you think about the things we learn about how to be an adult incorporating health and fitness is not one of them. Fitness was never a part of my life growing up outside of PE. Like most women, I would go to the gym for an aesthetic "need" such as a vacation, to shed the baby weight, or to fit in a wedding dress. These were goals that never really made life long impacts for me and I would easily and quickly go back to the life I was living before that. 3 years ago when my fitness journey started was when I realized the positive impacts that having a healthy relationship with nutrition and exercise were for me I knew I needed to share that to those around me, which is where my #gofitjo hashtag began (pre blog). I started to learn more and more about myself through fitness and for the past 18 months I was contemplating on whether or not I wanted to pursue a career in the health and fitness industry. After my experience in body building competitions and learning how to manipulate macronutrients and exercise in order to reach fitness goals I got turned onto the science of sports nutrition. Coupled with my 5 years of managing teams at VSCO, I knew I had a love for coaching and developing people. Don’t get me wrong,I love blogging and social media, but I also knew that it was only a place to inspire those to live healthier and was just a sliver to the what I could offer to those around me. I did a ton of research before joining IIN on the different types of nutrition schools and what they offer. I looked into Health Coach Institute, ACE, NASM and Well Coaches. I knew that I wanted to become a very well knowledgeable health coach. There are plenty programs that you can take that don't take as long as IIN. Some are weekend long courses while others are 4 weeks long. Personally, I love having as much knowledge and experience I can get in order to have the conversations I need with my future clients to understand their current philosophies on life and health and to help coach them through their next steps. After a year and a half of career ambivalence and research, Institute of Integrative Nutrition kept showing up in my life. I started to see others who went through the program and started to ask their experience in it. Then one day at my local Whole Foods I ran into some old friends and told them about my recent lay off at VSCO (literally a handful of days before) and how I’ve decided to finally take the plunge and sign up for school at IIN, a woman who overheard me mentioned how she was half way through. After my friends left, her and I started to talk about her experience and that night I decided to sign up. In my last few months at VSCO I said to myself, when I turned 35 (in 2 more years), I want to become a health & life coach focused on nutrition. After my own experience with my healthy life style, I knew the value of nutrition and how it really was a basis to fuel your everyday life including your career. My beliefs about health has always been around how one can define the health of each relationship in their life: marriage/love, parenthood, career, nutrition, and exercise. In order to vibrate at your highest frequency all of these areas need to have some sort of energetic alignment. 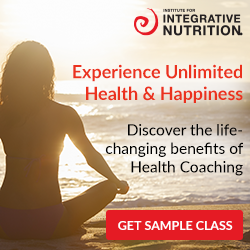 Institute for Integrative Nutrition really values and teaches this holistic way of approaching health and nutrition which is the main reason I was turned on by the approach of the program. Fitness to me was never about the perfect body, it was about getting your life together and overcoming insecurities which is a seed I want to plant in each of my client’s hearts and minds. Because of current “free time” I decided to enroll myself in the accelerated course that’s 7 months long rather than the regular course that’s 12 months long. The entire course is online so I can study at the convenient of my own pace and time. Every week a module gets released for the standard course, two modules for the accelerated course. You can download your modules on your iPad, iPhone, or whatever mobile device and study from anywhere. Some days I'm listening to modules while on BART on the way up to SF or in the car just to retain more information. I’m currently on module 9 out of the 40. There are discussion assignments to each module and along side all the different nutrition philosophies you learn there are foundational skills on business development along with coaching circles to fully equip you on your journey as a health coach. So far it's been incredible. I’m learning so much and because I’m such a nerd and meticulous about my approach with school, I’m trying to fully immerse myself and focus on all the modules week by week. There’s a lot of information to learn and it’s really fascinating to not only learn how you can help others, but to learn more about yourself and what nutrition really means for you. IIN talks about 4 primary foods: relationships, spirituality, career, and physical activity. These 4 areas, on top of nutrition were my top focuses bettering myself and my life. This alignment of views made my choice for Institute of Integrative Nutrition an easy one. If you're interested in learning more or to chat one on one on this, I'd love to get on a Google Hangout/Facebook Live/etc. when I have a group of at least 5 people so that we can all connect and ask as many questions as you like with me. If that's something that interests you, sign up here or fill out the form below. I hope my blog post was informative for you and I'm looking forward to getting to know more about your career goals and connect one step further. As soon as I have enough people interested I'll set up a webinar/Google Hangout/Facebook Live, whatever way we can connect more 1:1 or in an intimate group setting to answer any other questions you have. I'm looking forward to learning more about you and what you're envisioning as your next steps in your health journey. Today the hubs and I had the chance to go to Palo Alto to enjoy a lunch tasting over at Tava Kitchen and along side with the yummy food the best treat of all was having a conversation with one of the founders Hasnain. During our tasting we learned the story of Tava Kitchen along with the mission behind Tava Kitchen which was simple, to make America fall in love with South Asian cuisine and flavors. Hasnain walked us through the menu offerings as well as provided us with a sampling of a little bit of everything. We walked away falling in love with the preparations of the crunchy kale and quinoa salad that had the most explosive flavors of the masala vinaigrette. Californians love kale and to the rest of the world thats all we probably eat or juice. I think kale is one of those greens that is not only common to eat and create means with, but its also one of those that are not often paired in south asian cuisines so it was nice seeing it on the menu. My other favorite side was the candied beets. I'm a huge fan of beets and order them whenever I can. Its a great root vegetable that is designed to not only clean out your insides and liver, but root vegetables have been known to have energetic properties to ground you. So when you're feeling not yourself or needing to get centered, pull out those root vegetables like parsnips, radishes, carrots, and beets. Since I've been feeling under the weather, one of items on the menu that immediately looked tasty to me before trying it was the slow cooked braised chicken and braised beef. Which when I tasted them immediately made my soul feel a bit better. There's something about slowly cooked proteins that are simmering in a savory broth that reminds me of the good old soups made in Filipino households that made you feel immediately better when you feel under the weather. A plate with slow braised chicken and braised beef with crunchy quinoa and kale, and golden beets. A plate with braised lamb meatballs, chicken tikka, with crunchy quinoa and kale, and golden beets. For those who are vegetarian there are some options for you as well. Gluten Free, Paleo, and all the other dietary restrictions can easily be accommodated through the options of crafting your meal by either a bowl, plate, or burroti. Vegetarian bowl: Paneer tikka and tofu curry on top of a bed of romaine lettuce topped with pickled veggies, three pepper jicama, classic mix, and mild yogurt raita. Fresh juices and syrups made in house by Tava Kitchen. Over all I'm pretty impressed with the flavors of Tava Kitchen, but most blown away by their thoughtful items for infusing home cooked loved into healthy dishes without compromising the explosive flavors of the South Asian cuisine.